Meanwhile, the most active commercial grid, Avination, reported just under 9,000 unique users logging in over the past 30 days, according to our last grid survey report. OSGrid, the largest grid, reported around 3,500. (InWorldz does not release its active user numbers.) All other grids reported 2,000 unique user logins or less. 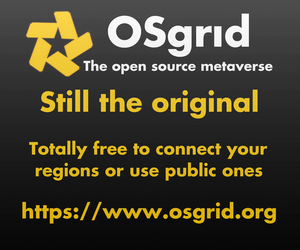 All together, all the top 40 public OpenSim grids combined had less than 20,000 monthly users. Meanwhile, Second Life has about 1 million unique visitors a month. Or, at least, it did in October — Linden Lab stopped publishing this data last fall, and it may have gone down a bit since then, but it is still a difference of a couple of orders of magnitude. 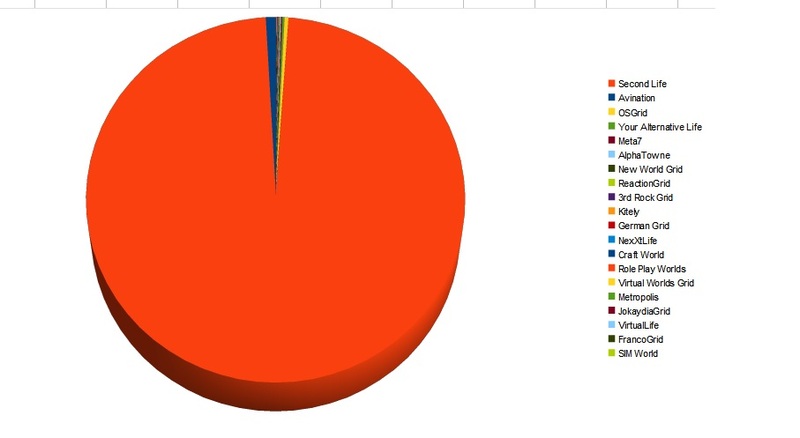 Unique monthly users as of mid-April. Second Life data -- in red -- is from October 2010. If you are a merchant, looking for the largest possible customer base for your products, there is currently no alternative to Second Life. That doesn’t mean that there’s no room at all for other grids. In fact, while Second Life’s base of potential customers is large, so is the number of competitors. A new OpenSim grid might offer a merchant an opportunity to make a reputation for themselves in a smaller, more comfortable environment. And there are several other ways in which OpenSim can make a great deal of economic sense to businesses. Second Life’s massive user numbers are irrelevant if your target audience or customer base isn’t there. If you’re a company looking for virtual meeting and collaboration space for your employees, or a school looking for virtual land for your classrooms, then Second Life’s user numbers are completely meaningless. Instead, other factors come into play — support, land costs, features, security. Depending on what your company is looking for, OpenSim can be a better option. The costs are much lower, for example, and some grids and independent hosting providers have excellent reputations for support. In addition, OpenSim has many features that Second Life lacks, including mega prims, region and inventory backups, hypergrid teleports, and mesh. OpenSim can also be modified, since it is open source software. Companies can integrate it with their corporate directories, for example, or back end databases. And OpenSim can be run fully behind a corporate or school firewall, for maximum security. Beyond students and employees, there are other groups that would fall into the “bring your own user” category, as well. For example, if you have a Facebook group, a quick and easy way to bring them in-world is to create a Kitely region. (More about Kitely here.) For occasional meetings, it would be a very cost-effective solution. Similarly, if you run a role playing guild, or a niche adult group, and your members will follow you whereever you go, then an OpenSim environment can offer more bang for the buck. Even if you produce virtual goods for retail sale, you can still benefit from using an OpenSim grid as a manufacturing area. In Kitely, for example, an unused region is just 10 cents a month, allowing you to create an unlimited number of regions in which you can warehouse your finished goods. Similarly, discount hosting or home-based hosting will also allow you to create objects at low or no cost, and will allow you to bring in your employees or collaborators. 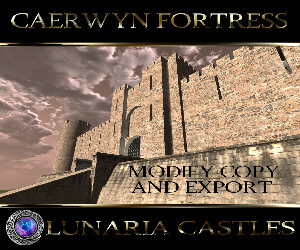 Once an object is finished, you can export it with the built-in export tools in Imprudence and other third-party viewers, and upload it to Second Life, InWorldz, Avination, or other grids. Bellissima Square on Bella region in InWorldz is just one of the grid's many shopping venues. With OpenSim, you can have as many backups of your regions as you need, including multiple versions of the same build.